One of the most important options that influence your decision to stay in a hotel for your weekend break is most likely the hotel’s proximity to the beach, because anyone who wants to travel to a beach city can’t deny that they want to indulge in the sea and beach. At Novotel Hua Hin Cha Am Beach Resort & Spa is a Beach accommodation in Hua Hin complete with a swimming pool featuring a water slide that you and your family/friends can enjoy together. Novotel Hua Hin Cha Am Beach Resort & Spa is one of the best Hua Hin Beach Front Resorts. This Beach accommodation in Hua Hin with a swimming pool is located only 200 kilometers from Bangkok, between Cha-am and Hua Hin. To visit us, you can arrange a private car or public transportation such as minivan or train. Discover the stunning view of the Gulf of Thailand and contemporary styled hotel that retains the tropical gardens and nature with all rooms facing the sea. Our resort is offering 4 room types that can satisfy all of our customer’s requirements. Our Superior room sized at 34 square meters between 5th-15th floor and Deluxe rooms of 42 square meters between 5th-20th floor. For that extra space and luxury, we offer guests a Suite complete with additional living area and mountain view. Sized at 64 square meters between 5th-20th floor it has ample room. For larger families, our Presidential Suite complete with double bedrooms and living area with kitchen and bathtub sized is 197 square meters of luxurious space located on the 23rd floor. 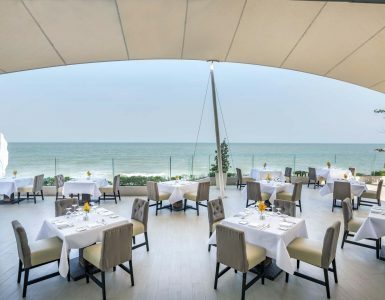 Additionally, Novotel’s beach accommodation in Hua Hin complete with swimming pool also has varieties of restaurants and bars to relax and enjoy food/drinks during your stay with us. If you want to pamper your skin, please don’t hesitate to try our InBalance Spa by Novotel offering many treatments by professional therapists. This holiday, don’t forget to bring your family and your loved ones to experience the ultimate relaxation with us at Novotel Hua Hin Cha Am Beach Resort & Spa. Read the reviews of bloggers who stayed at Beach accommodation in Hua Hin below.